The true essence of Orkney is said to be the deep rhythms of sea and land, nature and wilderness, darkness and light. Add to that pre-historic sites and ancient treasures and you get just a taste of what this wonderful tour has in store. From Edinburgh we leave the city behind and head northwards towards the Highlands. Soon we’ll make a photo-stop at Stirling Castle to enjoy the views of the Wallace Monument and the Ochil Hills beyond. We leave Stirling and travel to Doune, famed for its ruined medieval castle (of Monty Python's Holy Grail and Outlander fame), then onwards to Callander. Shortly we cross from the Lowlands into the Highlands and as we do pretty Loch Lubnaig waits to greet us. We're now in "Rob Roy” country and in a short while we will pass Balquhidder where the famous folk hero lived and is buried. From lonely Bridge of Orchy the road climbs steadily, offering great views, until we reach Rannoch Moor, an un-spoilt landscape of lochs, bog and little heather-clad hills that extend over 150 square miles! The moor provides a dramatic taster to awesome Glen Coe which is our next treat. We'll make a stop in the Glen of Weeping, so named after the infamous massacre of the resident MacDonald Clan by troops of the Campbell Clan. A short drive brings us to Fort William which has a picturesque setting on the banks of Loch Linnhe. Towering above the town is Ben Nevis, Britain's tallest mountain. We'll make a stop so you can enjoy the panorama before entering The Great Glen, a striking landscape of mountains, cascading rivers and three lochs – Oich, Lochy and, most famously, Ness. The attractive town of Fort Augustus is our gateway to Loch Ness and our home for tonight. It's an early start today as we tour along the banks of the loch keep that camera ready, just in case its elusive resident makes an appearance! Look out for ruined Urquhart Castle as we travel towards Inverness, the Capital of the Highlands. We cross the Moray Firth and drive through the Black Isle to the Cromarty and Dornoch Firths. Soon we will pass Dunrobin Castle, the grand home of the Earls and Duke of Sutherland. As we drive towards nearby Golspie you will see a statue of the First Duke on top of a nearby mountain. It was he who, enthusiastically, embraced the farming of sheep on his estate in the early 19thCentury which forced many tenants from their land. We'll hear more about the "Highland Clearances” as we drive northwards. Orkney is home to many outstanding historic treasures and today will be a unique day of discovery. On our itinerary are visits to Maeshowe *,a magnificent tomb built almost 5,000 years ago and the Ring of Brodgar, a stone circle that once comprised of 60 megaliths. The site is some 1,000 years older and three-times larger than the more famous circle at Stonehenge. The neolithic settlement of Skara Brae * lies near the dramatic white beach of the Bay of Skaill. Uncovered by a great storm in 1850 Skara Brae is the best preserved group of prehistoric houses in Western Europe and presents a remarkable picture of life around 5,000 years ago. During our optional visit we will get a vivid impression of the realities of a prehistoric village and see ancient homes fitted with stone beds, dressers and seats. It is an early start today as we cross the Pentland Firth by ferry. 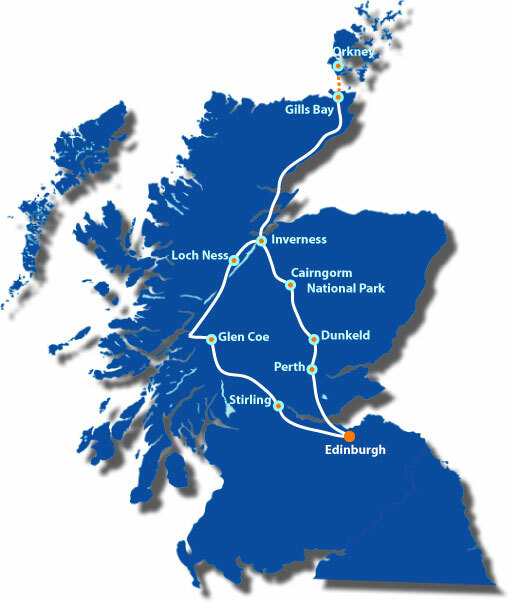 Once back on the mainland we follow the coastal route southwards through the attractive fishing villages of Dunbeath and Helmsdale to Inverness, the Capital of the Highlands. Culloden Moor was the site of the last battle ever fought on British soil in 1746. It was here that Bonnie Prince Charlie's Jacobite army was routed by Government troops. There's an opportunity to tour the award-winning visitor centre * which explains more about this famous battle that changed life in the Highlands forever. The natural beauty of the Cairngorm National Park is our next treat before crossing the Grampian Mountains and arriving in Highland Perthshire. We'll make a stop in the attractive town of Pitlochry before making our way through the ancient Kingdom of Fife to the end of our tour in Edinburgh.